"Texas teachers unions sue education agency over charter partnership law" was first published by The Texas Tribune, a nonprofit, nonpartisan media organization that informs Texans — and engages with them — about public policy, politics, government and statewide issues. * This story has been updated throughout. "Contrary to legislative intent ... the Commissioner's rules challenged in this lawsuit reduces the number and type of charter operators that must abide by the rules that were put in place to protect public school employees in SB 1882 charter schools and relaxes the requirements that the school district and charter operator need to satisfy before they can qualify for the benefits available under the law," the lawsuit reads. The teachers argued that district officials violated state law by entering into a contract with Democracy Prep without consulting Stewart Elementary School's staff. The contract, ultimately approved by the state, lets Democracy Prep make all hiring decisions and forces San Antonio ISD teachers to reapply to work at the school. Wednesday's lawsuit cites this local battle. Responding to San Antonio ISD's proposed partnership in late May, Morath said school district officials did not have to consult with school employees about the contract because Democracy Prep is not a Texas-approved open-enrollment charter. That letter counts as an interpretation of state law, and one that did not happen through the official state-required process, "making the rule invalid," TSTA and AFT argue in the lawsuit. The lawsuit also argues that two of the guidelines Morath set out for SB 1882 violate existing state education law. One of the guidelines require the low-performing campus to be exempt from all district policies, beyond those agreed to in the partnership. The other gives Morath the authority to approve a partnership request if he determines it will "improve student outcomes" at the campus. "It is an invalid rule that illegally usurps the authority of local school districts to apply their own local policies to SB 1882 arrangements and illegally subjects the rights and benefits of the plaintiff's members, as provided for in local district policies, to unwarranted control by the commissioner," the lawsuit says. Texas teachers unions sue education agency over charter partnership law By Aliyya Swaby August 29, 2018 * This story has been updated throughout. Two teacher associations sued Texas Education Commissioner Mike Morath and the Texas Education Agency on Wednesday, arguing they rolled out a law incentivizing partnerships with school districts and charter schools in a way that weakened protections for public school employees. The lawsuit, filed in Travis County District Court, centers on Senate Bill 1882, which lets traditional school districts partner with outside organizations — including charter schools and nonprofit organizations — to turn around low-performing schools and receive a temporary reprieve from harsh state penalties and gain additional state funding. The Texas State Teachers Association and the Texas chapter of the American Federation of Teachers, a national teachers union, argue in the suit that Morath exceeded his authority in releasing schools seeking partnerships from existing state regulations — harming teachers who benefit from those rights. "Contrary to legislative intent ... the Commissioner's rules challenged in this lawsuit reduces the number and type of charter operators that must abide by the rules that were put in place to protect public school employees in SB 1882 charter schools and relaxes the requirements that the school district and charter operator need to satisfy before they can qualify for the benefits available under the law," the lawsuit reads. The lawsuit is part of a larger Texas debate about whether the state’s increasingly tough accountability measures will successfully get schools to meet higher educational standards. Educator groups also have consistently criticized Morath for prioritizing the growth of Texas charter schools — privately-managed public schools with fewer state regulations — to the detriment of traditional public schools. Morath “is an unabashed cheerleader for charter schools,” said Texas AFT president Louis Malfaro at a news conference Thursday morning. 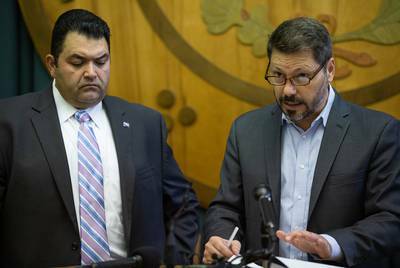 Noel Candelaria, president of the Texas State Teachers Association, and Louis Malfaro, president of the Texas chapter of the American Federation of Teachers, at a press conference at the Capitol on August 30, 2018. Rachel Zein for The Texas Tribun The groups are asking the court to find Morath’s rules invalid. The TEA declined to comment on the lawsuit Thursday, referring inquiries to the Texas attorney general. SB 1882 was intended to serve as a lifeline for school districts that needed more resources and more time to get students in chronically failing schools performing better on standardized tests and meeting state standards. Under this law, districts turn over management of their low-performing schools to their partner organizations, which could be universities, nonprofits or charters. But as school districts started publicly weighing potential partnerships, some heard loud resistance from teachers unions concerned about losing rights in their existing employment contracts and community members angry about giving up the management of their struggling schools, many of which are located in majority black and Hispanic neighborhoods. In early May, the San Antonio teachers union filed a lawsuit against San Antonio ISD to stop it from moving forward with a partnership with Democracy Prep, a charter school operator based in New York. The teachers argued that district officials violated state law by entering into a contract with Democracy Prep without consulting Stewart Elementary School's staff. The contract, ultimately approved by the state, lets Democracy Prep make all hiring decisions and forces San Antonio ISD teachers to reapply to work at the school. Wednesday's lawsuit cites this local battle. Responding to San Antonio ISD's proposed partnership in late May, Morath said school district officials did not have to consult with school employees about the contract because Democracy Prep is not a Texas-approved open-enrollment charter. That letter counts as an interpretation of state law, and one that did not happen through the official state-required process, "making the rule invalid," TSTA and AFT argue in the lawsuit. The lawsuit also argues that two of the guidelines Morath set out for SB 1882 violate existing state education law. One of the guidelines require the low-performing campus to be exempt from all district policies, beyond those agreed to in the partnership. The other gives Morath the authority to approve a partnership request if he determines it will "improve student outcomes" at the campus. "It is an invalid rule that illegally usurps the authority of local school districts to apply their own local policies to SB 1882 arrangements and illegally subjects the rights and benefits of the plaintiff's members, as provided for in local district policies, to unwarranted control by the commissioner," the lawsuit says. Proponents of the partnership law released a statement Thursday claiming the lawsuit is an attempt by nationally-affiliated teachers unions to undermine the state’s progress on school improvement. “State lawmakers from both sides of the aisle have repeatedly praised the work of Commissioner Morath on his performance leading the Texas Education Agency. It is beyond a stretch to claim TEA’s rule-making is not a faithful extension of lawmakers’ legislative intent,” said Will Fullerton, executive director of Texas Aspires, which advocates for stricter accountability laws. Kathryn Lundstrum contributed reporting. Read related Tribune coverage Texas school districts struggled to use law that could stave off state takeover Are charter schools private? In Texas courts, it depends why you're asking. In historic win, charters getting state funding for facilities for the first time "Texas teachers unions sue education agency over charter partnership law" was first published at by The Texas Tribune, a nonprofit, nonpartisan media organization that informs Texans — and engages with them — about public policy, politics, government and statewide issues. Link back to the original article, which is located at https://www.texastribune.org/2018/08/29/texas-teachers-unions-sue-education-agency-over-charter-partnership-la/.